Excellent mansion tour + beautiful views of the Potomac + beautiful grounds + excellent hands-on museum = worth the admission fee! Yes, I do think that George Washington's home is one of the best presidential tours in the US (but I'll still show you ways to see it for less!). Below, you'll find information on admission, details of the house and museum tour, best times to visit, and nearby sites you won't want to miss. Washington is one of those historical figures where the more you learn about them, the more impressed you become. I like to think of him as an 18th-century Ronald Reagan-- a great politician (where you like his politics or not), and the type of guy you'd actually like to spend dinner with. Mount Vernon is the best place to get to know this amazing man who was far, far more than just the founder of our country. The front view of George Washington's Mount Vernon. I have to admit, if there's one thing I wish was different about Mount Vernon, it would be that the house tour wasn't so rushed. Due to the huge number of guests they have daily, they really push you through the house in 15-35 minutes. It depends on which season visit. Go during the summer season and you'll be rushed through at lightning speed. That's why if you want a more leisurely pace, I recommend that you visit during the winter (more on that later). Basic tours of this 21-room mansion include a docent-led visit to the first and second floors of the mansion where they explain the original architecture, Washington's relationship with his wife, Martha, a bit about his time in the White House, a lot about how they chose the furnishings, and what happened in his declining years leading to his death. The house was originally built in 1735 by Washington's father, Augustine. Over the next 50 years or so Washington expanded the house greatly, finally coming to spend his declining years there. Like many mansions of the time, the house is surprisingly long but narrow, which allow breezes to come through the houses to help with the stifling summer heat. Mount Vernon river side view. Green everywhere! Many of the rooms at the mansion are different shades of green. Although it may seem somewhat startling or even hideous to the modern eye, the green verdigris paint used in the dining room was highly expensive in George's day and used to show off one's wealth. The fan chair in the study. Although this is not the original, you can see a chair with a big wooden fan above it that is similar to one that Washington purchased in Philadelphia while attending the Constitutional convention in 1787. The room where Washington breathed his last tortured breath and died in 1799. After catching a chill during a wet ride, Washington fell ill. A series of doctors prescribed a variety of treatments including bleeding. It's believed that Washington was bled and lost more than 32 ounces of blood during this ineffective treatment before finally dying -- probably of epiglottis, a throat infection -- a few days later. They have an excellent virtual tour available by clicking here. 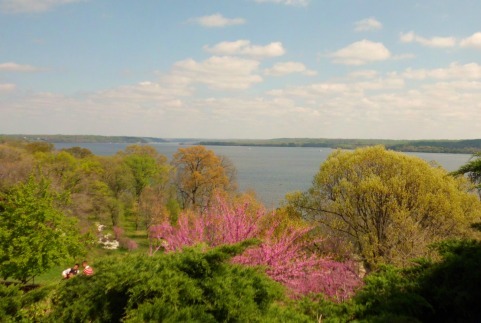 Mount Vernon has beautiful views of the Potomac River. Before or after your tour, be sure to visit the grounds dozen or so outbuildings, including a stable, overseers quarters, slave cabins, a blacksmith shop, and a 16 sided barn. You can explore these at your leisure. The barn is a bit of a walk, but very much worth it, as are the distillery and grist mill. Part-way between the house and the barn, you'll come across Washington's tomb. It's actually quite moving to stand there and give thanks to this amazing man for what he did for America. On a beautiful spring or summer day, you could literally spend hours just enjoying the estate gardens, which include a Bowling Green, slave memorial, and of course, fantastic views of the Potomac River. Just a few years ago, Mount Vernon remodeled its museum and education center and I have to admit, it is really impressive. It includes 23 galleries, theaters with History Channel videos, interactive displays, and over 700 objects related to Washington. 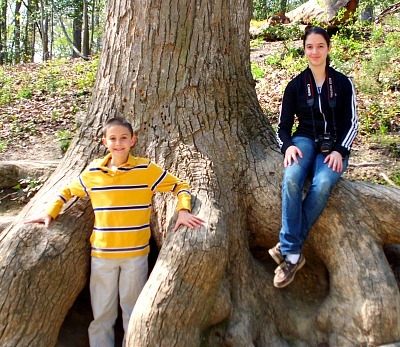 Mount Vernon has beautiful grounds, perfect for family photos! a multi-media theater where it actually snows! Washington's dentures get this-by the time he became president at age 57 he had only one natural to the left! These dentures are made of human cow and horse teeth as well as elephant and walrus ivory. Actually pretty hideous! 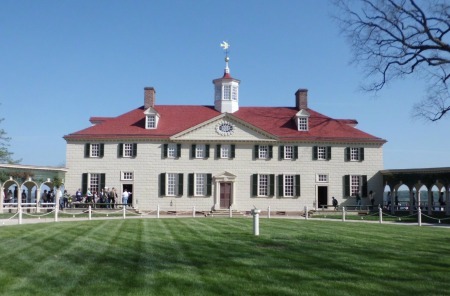 Mount Vernon is is open 365 days a year. General admission includes the estate grounds, a basic tour of the mansion, the outbuildings (the distillery and gristmill are open April through October). Most days, the estate is open from 9 AM to 5 PM. Tickets are $20 for adults (ages 12 to 61), $11 for youth ages 6 to 11, and $17 for seniors age 62 and older. Children five and under are free. You can save $2 on admission when you purchase tickets in advance online. 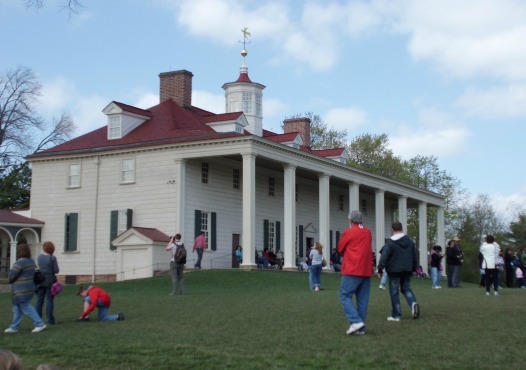 Due to the number of guests at Mount Vernon, all house tours have a scheduled time. Do you make sure you get there early as lines can be quite long and it would be a shame to miss your time. In addition to the basic admission package, you can pay extra for specialty tours including an audio tour, sightseeing tours on the Potomac, garden and landscape tours, slave life tours, and perhaps most interesting of all, the National Treasure Tour (March through December only) which lets you visit scenes used during the filming of the movie National Treasure: Book of Secrets ($5 per person). The cheapest way to visit Mount Vernon is to go on Washington's Birthday (usually celebrated on President's Day). On that day, admission is free all day and they offer a variety of extra programs. The only downside is that the weather which can be really cold (even snowy) that time of year. We last visited in early April, which is a great time to visit because things are starting to bloom but there weren't too many visitors. Another option for visiting with fewer crowds is to go during Christmas. One docent told me that house tours tend to be much longer at that time of year, plus you get to see the house decorated for Christmas. For more information on Mount Vernon, or to purchase tickets, go to their official website. There are a number of ways to tie in your visit with other fascinating local sites. Nearby Alexandria has a vibrant, historic downtown with lots of shops and boutiques, as well as historic attractions like Gunston Hall and the Torpedo Factory which is now an exhibition center for local artists. Don't miss our favorite Alexanderia restaurant, Cheestique. It just looks like a fancy cheese shop from the front (albeit with exotic cheeses you've never even heard of - tastings are free!) but if you go to the back you'll find a restaurant with the most amazing cheese-related dishes, including several different types of macaroni and cheese (my husband's favorite is macaroni and cheese with blue cheese). Here is their address: 2411 Mt. Vernon Ave, Alexandria, VA 22301. The estate is also just a short drive depending on traffic of course this is Washington DC after all from all the major sites in Washington DC. Learn more about my recommended spots in Washington DC here.